Slider leaders have a corkscrew swivel between two beads to attach your weight where it can slide up and down the leader to keep your leader from tangling and so the fish can grab your lure without feeling the lead. 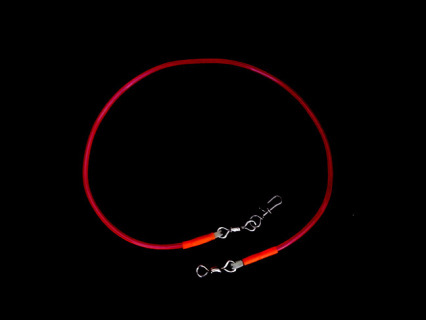 Slider Leaders use 500 pound test mono with UV or Glow tubing over the monofilament from the hook to 15 inches above, where it has a crimp. 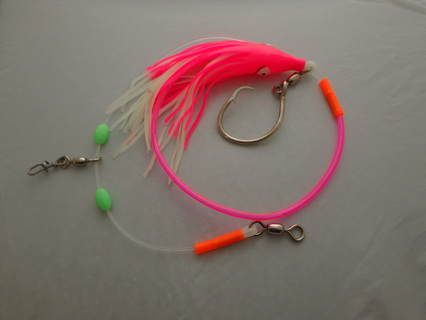 The tubing increases the leader's visibility and attracts halibut from greater distances. The weight slides above the tubing to the 6/0 swivel where the mainline attaches. An upside down 7.5 inch double skirt hangs over the 16/0 Mustad circle hook and size 6/0 swivel. The skirt gives the leader a life-like action that mimics squid and octopus which sends halibut into a feeding frenzy. 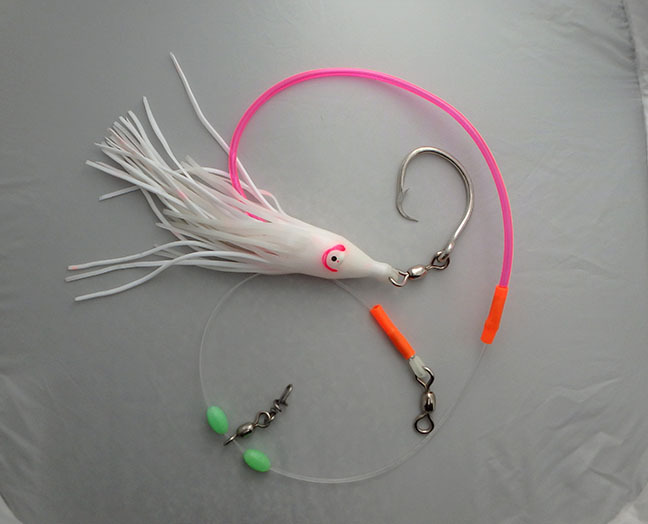 For best results Add your favorite bait to the circle hook and send to the bottom, then raise it four to six feet off bottom.. Best baits include pink salmon bellies, herring, squid, octopus, mackerel and salmon guts. SECURE CHECK-OUT! We accept Visa, Mastercard, and Discover as well as PayPal. When checking out online you may have to go through several screens before you get to the option to use your card. If you are outside the USA, don't want to checkout through PayPal, or have problems checking out on this site you can find these products at SquidLures.com. 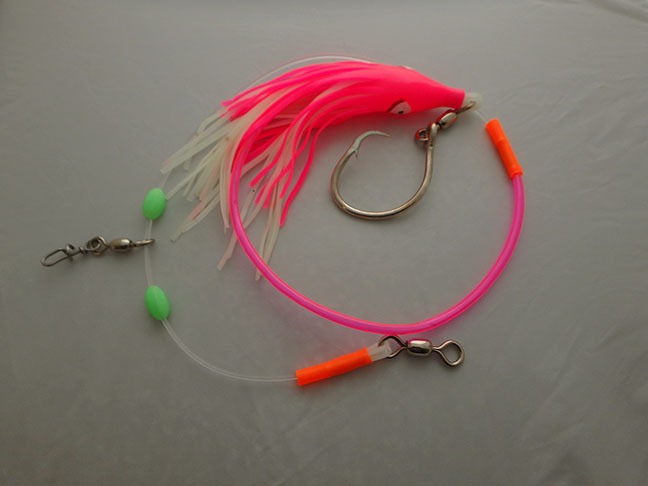 Long leader with pink over glow upside down 7.5 inch double skirt on 16/0 circle hook with 6/0 swivel. Corkscrew swivel for easy lead attachment slides between two large glow beads on 500 pound test monofilament line. 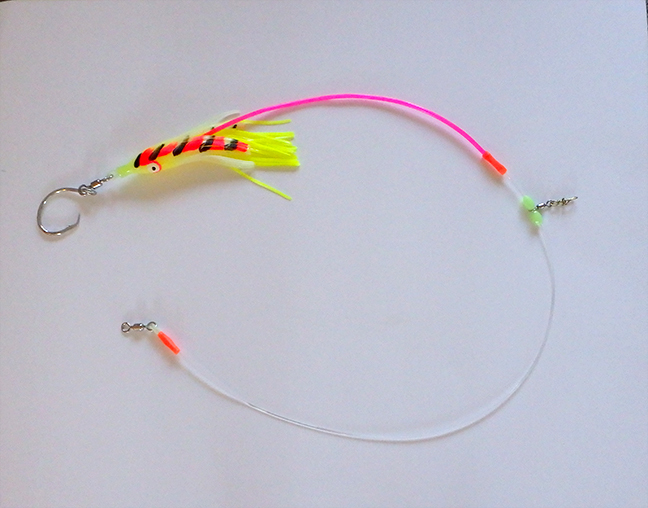 UV tubing over the line nearest the hook keeps weight away from the lure. 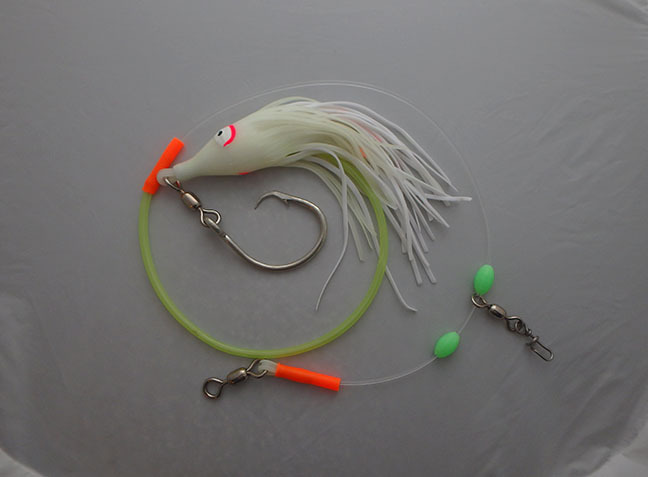 Long leader with glow over white upside down 7.5 inch double skirt on 16/0 circle hook with 6/0 swivel. Corkscrew swivel for easy lead attachment slides between two large glow beads on 500 pound test monofilament line extending beyond UV tubing over the line by the hook. Made in the USA. Long leader with green and glow over chartreuse upside down 7.5 inch double skirt on 16/0 circle hook with 6/0 swivel. 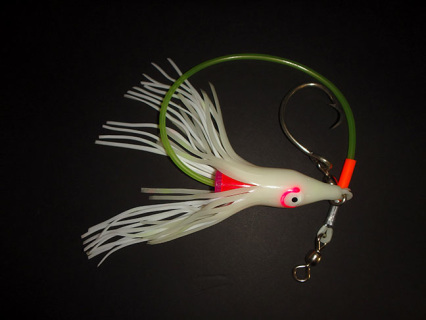 Corkscrew swivel for easy lead attachment slides between two large glow beads on 500 pound test monofilament line. UV tubing over the line by the hook keeps the weight away from the lure. 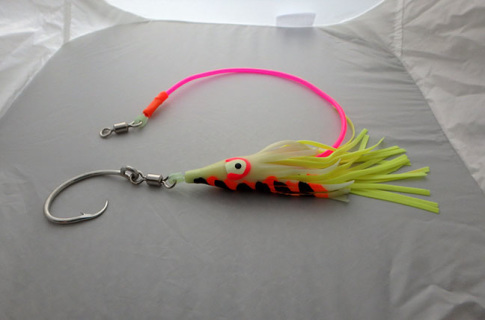 Long leader with orange and black stripes and glow over chartreuse upside down 7.5 inch double skirt on 16/0 circle hook with 6/0 swivel. 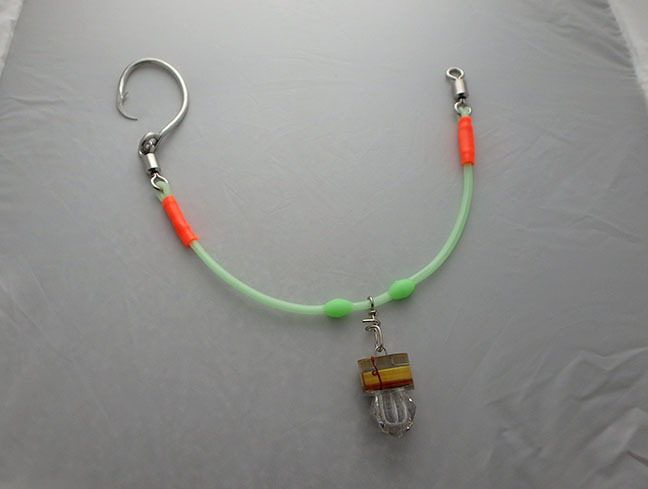 Corkscrew swivel for easy lead attachment slides between two large glow beads on 500 pound test monofilament line extending beyond UV tubing over the line by the hook. Made in the USA. Long leader with pink over glow upside down 7.5 inch double skirt on 16/0 circle hook with 6/0 swivel. 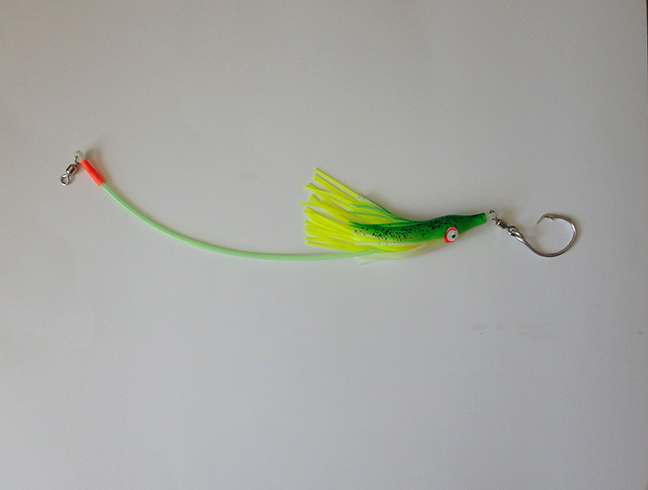 Corkscrew swivel for easy lead attachment slides between two large glow beads on 500 pound test monofilament line. 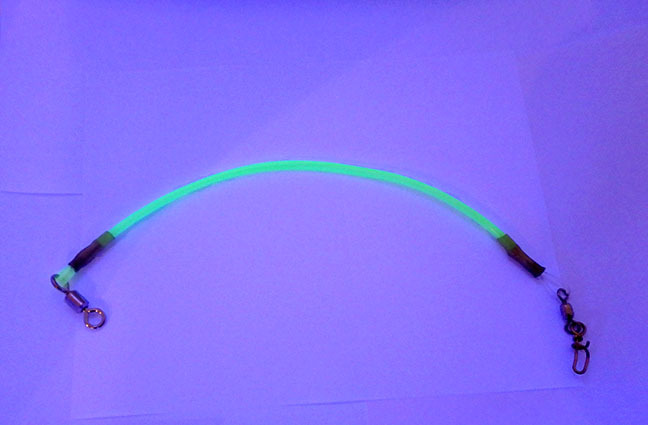 Glow tubing over the line nearest the hook keeps weight away from the lure. 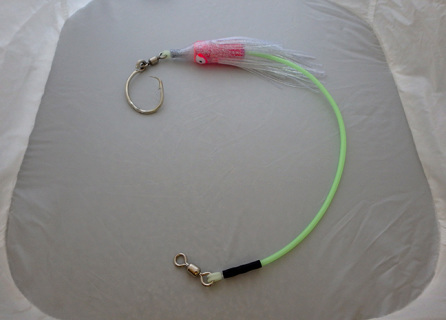 Long leader with glow over white upside down 7.5 inch double skirt on 16/0 circle hook with 6/0 swivel. 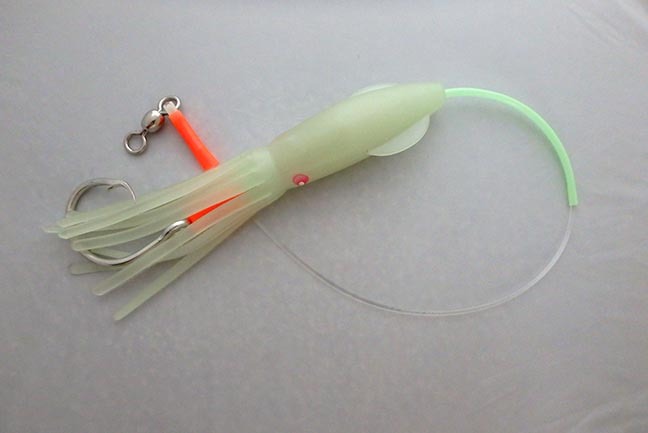 Corkscrew swivel for easy lead attachment slides between two large glow beads on 500 pound test monofilament line. 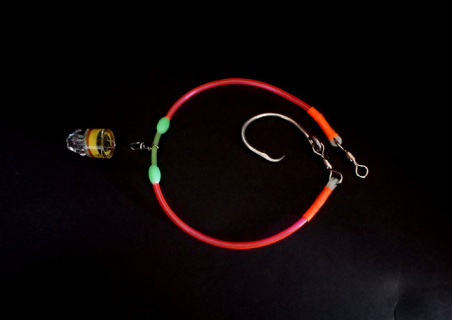 Glow tubing over the line closest to the hook keeps the weight away from the lure. 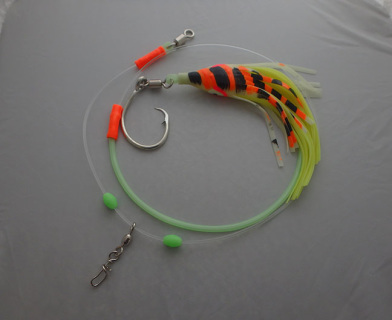 Long leader with orange and black stripes and glow over chartreuse upside down 7.5 inch double skirt on 16/0 circle hook with 6/0 swivel. Corkscrew swivel for easy lead attachment slides between two large glow beads on 500 pound test monofilament line extending beyond glow tubing over the line by the hook. Made in the USA. pink salmon bellies, herring, squid, octopus, mackerel and salmon guts. OctoSquid Leader has upside down UV 7.5 inch double skirt with UV tubing over 500 pound test monofilament line on 16/0 circle hook.with swivel. Short leader great for hanging from metal spreader bar. 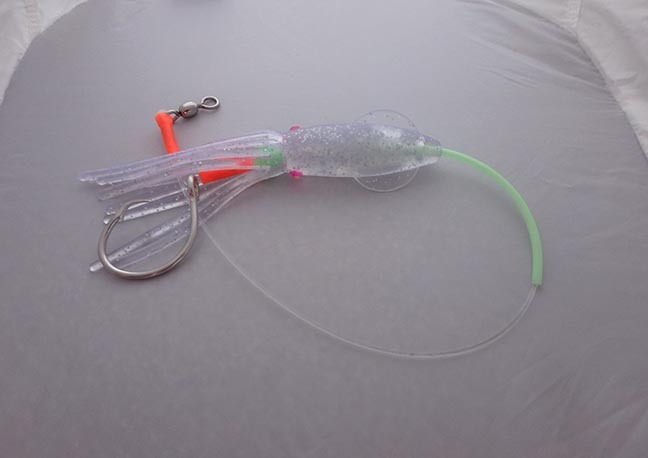 Octosquid leader with a scent tube inside the skirt to fill with your favorite scent for more fish attracting power. 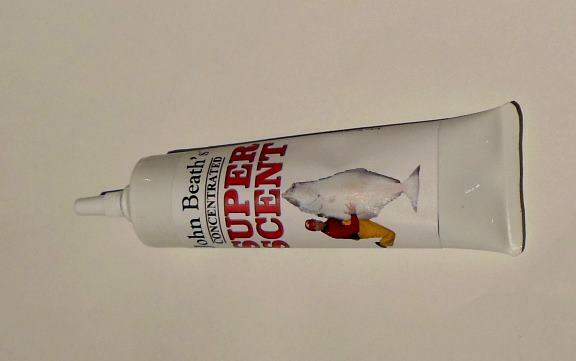 This inline scent tube helps to create a stronger scent field to attract halibut to the leader. An upside down 7.5 inch double skirt hangs over the 16/0 Mustad circle hook and size 6/0 swivel. For best results, insert a size 39mm or 50mm light stick into the scent tube, along with a piece of foam or sponge. Then add your favorite scent, such as Super Scent oil. 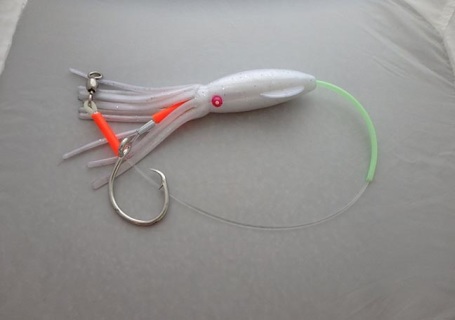 OctoSquid Leader has upside down glow over white 7.5 inch double skirt with glow tubing over 500 pound test monofilament line on 16/0 circle hook.with swivel. Scent tube is inside the skirt with the line strung through it. Short leader ideal for use with metal spreader bar. 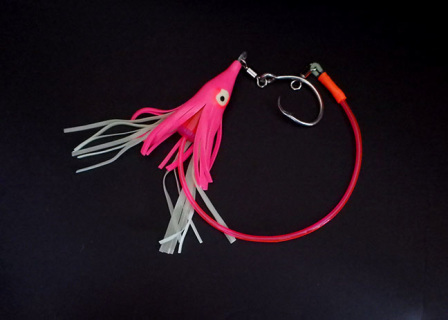 OctoSquid Leader has upside down pink over glow 7.5 inch double skirt with glow tubing over 500 pound test monofilament line on 16/0 circle hook.with swivel. Scent tube is inside the skirt with the line strung through it. Short leader ideal for use with metal spreader bar. OctoSquid Leader has upside down half glow and half UV green glow over UV chartreuse 7.5 inch double skirt with glow tubing over 500 pound test monofilament line on 16/0 circle hook.with swivel. Scent tube is inside the skirt with the line strung through it. 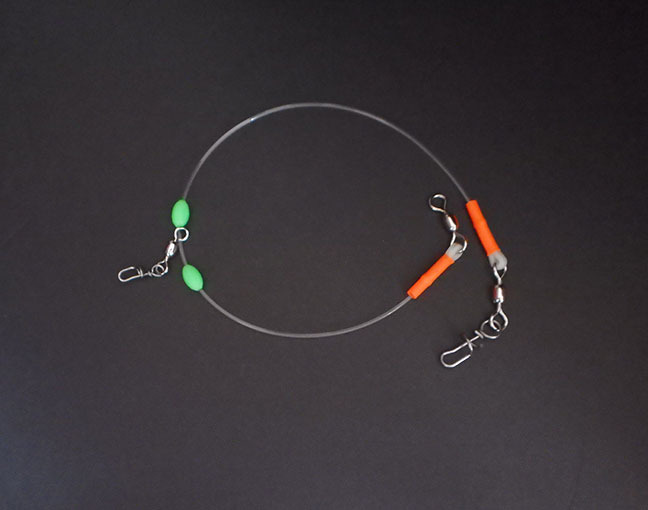 Short leader is perfect for hanging on metal spreader bar, but can also attach to the mainline. OctoSquid Leader has upside down orange and black stripes with glow over UV chartreuse 7.5 inch double skirt with glow tubing over 500 pound test monofilament line on 16/0 circle hook.with swivel. Scent tube is inside the skirt with the line strung through it. Short leader perfect for hanging on metal spreader bar. OctoSquid Leader has upside down UV 7..5 inch double skirt with glow tubing over 500 pound test monofilament line on 16/0 circle hook.with swivel. Scent tube is inside the skirt with the line strung through it. 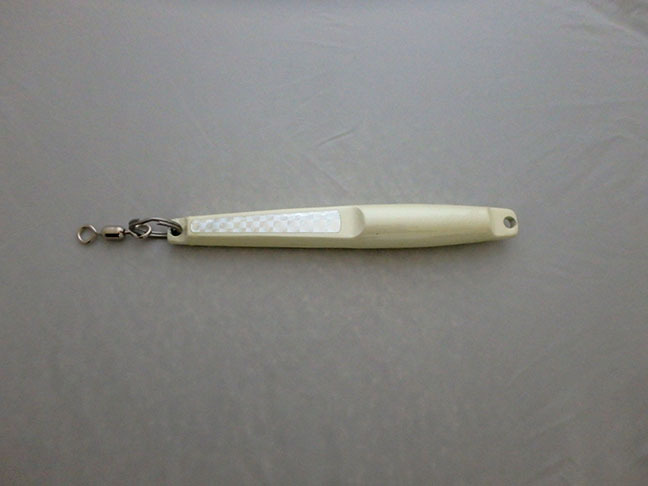 Short leader perfect for use with metal spreader bar. Made in the USA. 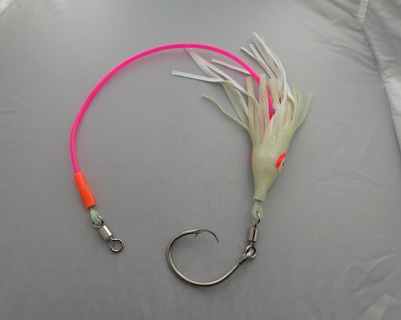 OctoSquid Leader has upside down glow over white 7.5 inch double skirt with UV tubing over 500 pound test monofilament line on 16/0 circle hook.with swivel. Scent tube is inside the skirt with the line strung through it. Short leader is ideal for use with metal spreader bar, but can also be attached directly to the mainline. OctoSquid Leader has upside down pink over glow 7.5 inch double skirt with UV tubing over 500 pound test monofilament line on 16/0 circle hook.with swivel. Scent tube is inside the skirt with the line strung through it. These short leaders work great alone or on a metal spreader bar. 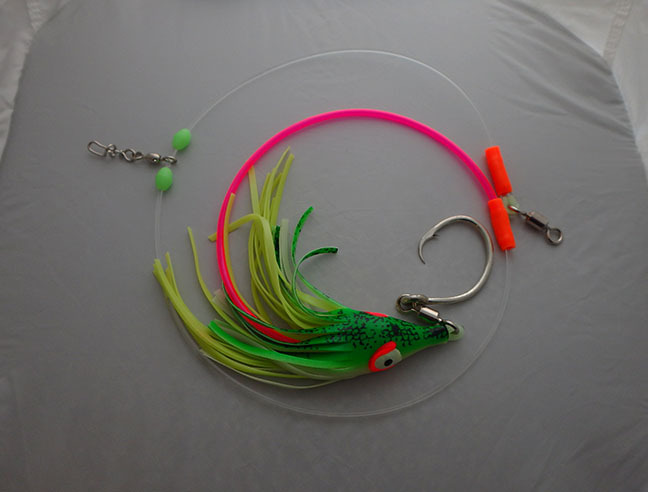 OctoSquid Leader has upside down green and glow over chartreuse 7.5 inch double skirt with UV tubing over 500 pound test monofilament line on 16/0 circle hook.with swivel. Scent tube is inside the skirt with the line strung through it. Use these short leaders alone or on a metal spreader bar. 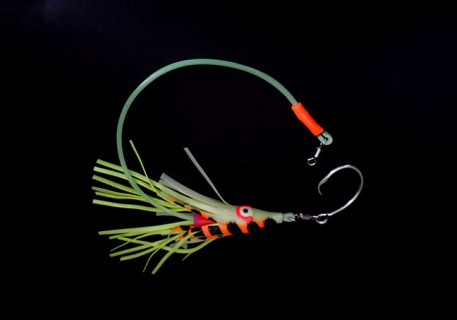 OctoSquid Leader has upside down orange and black stripes with glow over chartreuse 7.5 inch double skirt with UV tubing over 500 pound test monofilament line on 16/0 circle hook.with swivel. Scent tube is inside the skirt with the line strung through it. Short leader is perfect for hanging on a metal spreader bar, but it can also go directly on the mainline. Super Scent oil is made from real baits including, Herring, Squid, Shrimp, Salmon eggs, Crab & Octopus. 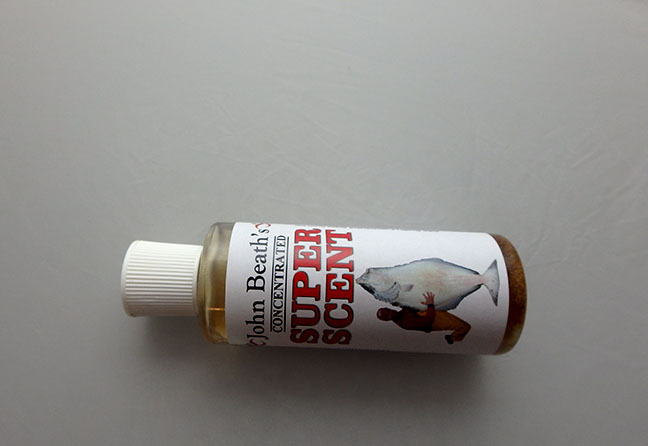 Super Scent oil works well on all baits or lures and can be poured onto the yarn scent ball in the Z2 and fat squid or used to fill a scent tube on the lure. 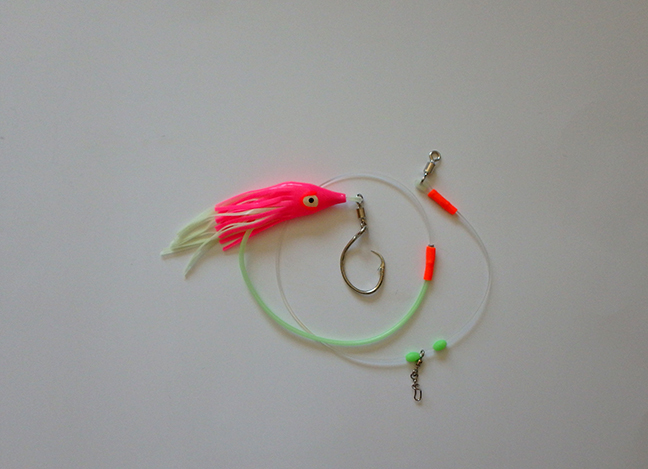 Double your chances with this double fishing rig. 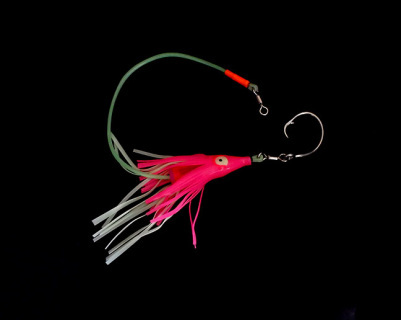 2 pink glow upside down double skirts rigged with 16/0 circle hooks on 500 pound test monofilament line. One skirt has glow tubing, the other has UV. 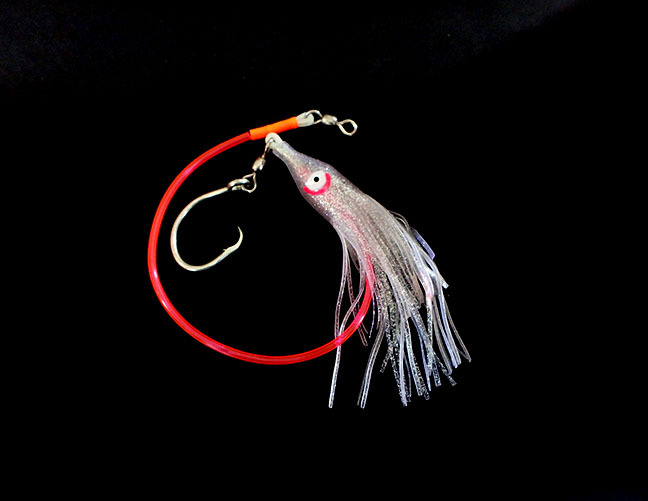 Swivels keep your rig from tangling when a fish is on one hook. Rig has swivel at one end to attach to line and corkscrew swivel at the other end for weight. Made in the USA. Double your chances fishing two lures at once. This double rig has our two most popular color combos with one glow/white skirt on UV tubing and one glow green ghost skirt on glow tubing. Both skirts have scent tubes where you can add your favorite scent or put in a light stick to light them up from within - or both. Comes with 2-pack of light sticks. Rig also has a corkscrew swivel to add your weight. Made in the USA. 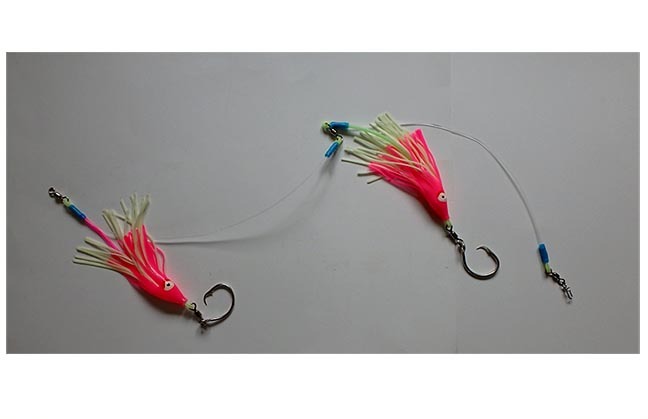 Fish 2 squid lures at the same time to double your chances! Gangion rig has 2 corkscrew swivels for attaching squid lures and one for weight. Fish this 500 lb test leader by banging the bottom and then raising it 4 feet up. 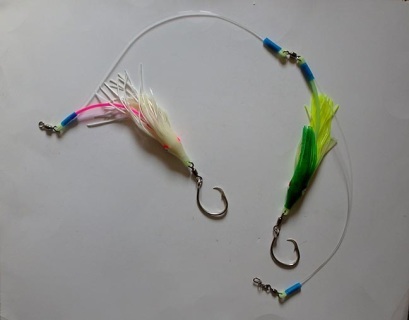 In areas that snag lures, hang the weight on a thinner line so if it snags you are more likely just to lose the weight. Works great with 7.5 inch fat squids or fully rigged Z2 squids. Made in the USA.Squids sold separately. Water activated light attaches right to this leader on easy change corkscrew which can slide in short inch section between two large glow beads at the center. 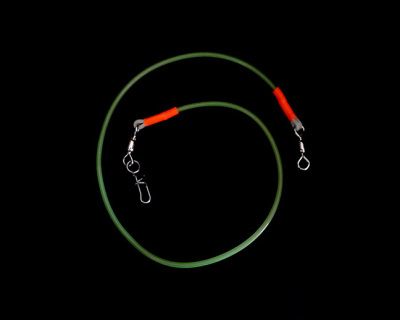 Made in the USA from 500 pound test monofilament line with 16/0 circle hook. Water activated underwater light flashes when immersed into water. Light lasts for about 250 hours of use. Water activated light attaches right to this leader on easy change corkscrew which slides in short inch section between two large glow beads at the center. Made in the USAfrom 500 pound test monofilament line with 16/0 circle hook.. Water activated underwater light flashes when immersed into water. Light lasts for about 250 hours of use. Assorted leaders for jigs, squid lures, lights, or weights. Add your weight to the corkscrew swivel between two large glow beads and it can slide nearly the full length of this 500 pound test monofilament leader. Leader has swivel on one end and corkscrew swivel on the other. Made in the USA. 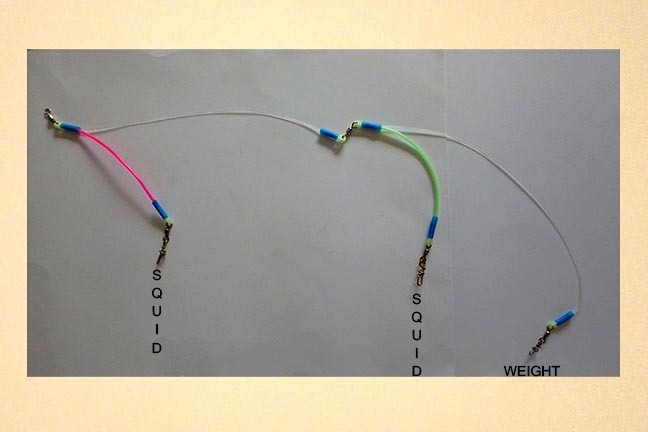 Attach any fully rigged squid to spreader bar or mainline with this 500 pound test glow leader. Leader is about a foot long not including swivels. Made in the USA. Use these weights with the weight slider, slider leaders, on spreader bars, or anywhere else you need added weight. Or add a hook and use them for jigs. 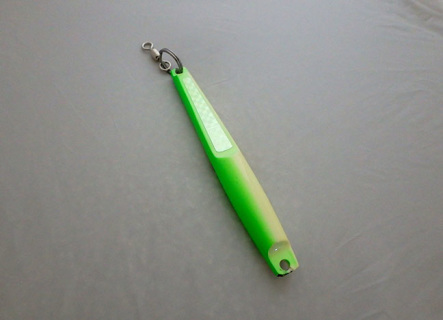 10 1/2 oz iron weight in green and glow with reflective strips. Comes with split ring and swivel. 10 1/2 oz iron weight in white with reflective strips. Comes with split ring and swivel. 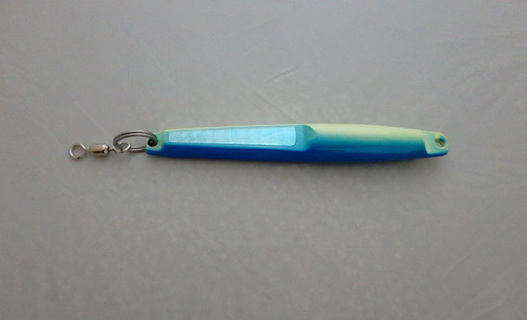 11 oz iron weight in blue and glow with reflective strips. Comes with split ring and swivel. 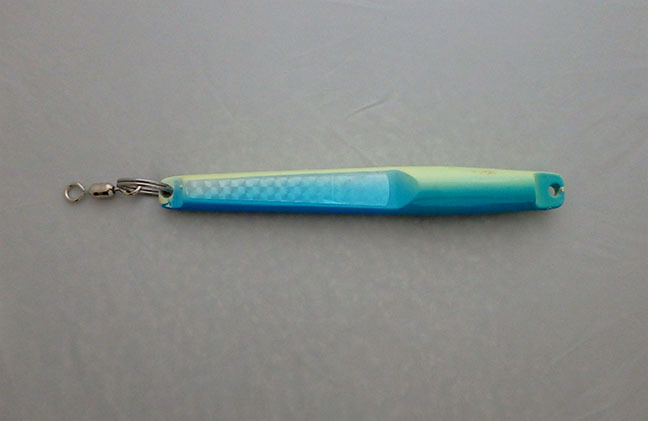 13 oz iron weight in blue and glow with reflective strips. Comes with split ring and swivel. We accept Visa, Mastercard, and Discover as well as PayPal. When checking out online you may have to go through several screens before you get to the option to use your card. Secure check-out. 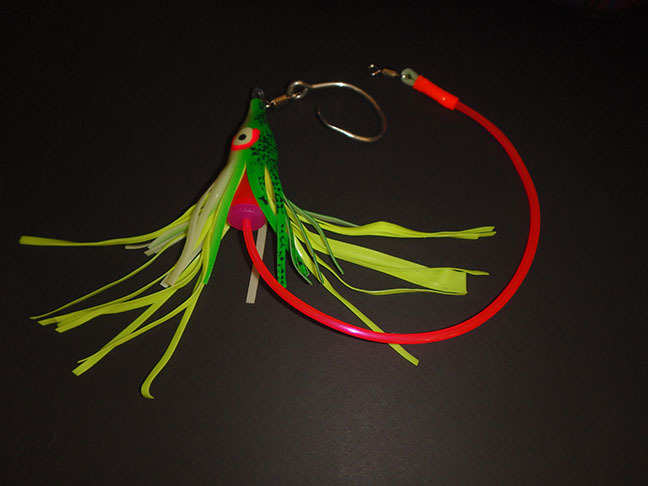 ​If you are outside the USA please shop for these products at SquidLures.com. Foreign orders placed on this site may be asked to send additional money for shipping.